Product prices and availability are accurate as of 2019-04-23 18:06:37 EDT and are subject to change. Any price and availability information displayed on http://www.amazon.com/ at the time of purchase will apply to the purchase of this product. Black out. Battery gone flat. Broken down car. Bad radio signal. There's definitely not an app for that. 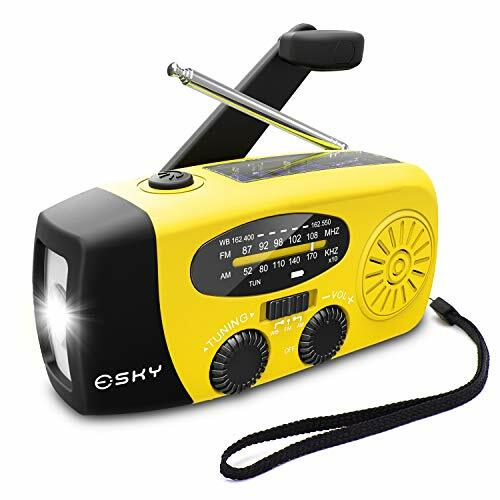 The ES-CR03 Solar Hand Crank Radio is the upgraded edition of Esky's best selling handheld device. Featuring a Swiss army of gadgets to will crank you out of any emergency situation, it can light up dark spaces in a flash, charge phones, iPads, and USB powered devices and, and provide up to the minute information with the LCD clock and AM/ FM radio. The Esky team have been training for this upgrade so much that when it came to designing the ES-CR03 they were ready to create something that could really go the full marathon. That's why the Esky battery has charged ahead from 1000mAh to 2000mAh meaning twice the battery life and twice the phone charging capacity. 3 charges in one means Esky is always ready when you need it, with USB docks, solar panel and hand crank Phone gone flat Esky's USB and Micro USB ports give your phone charge the boost it needs when juice is running low Flashlight provides you worth 140 Lumens of super bright light, so you won't ever get caught in the dark AM/FM/NOAA Radio keeps you informed of any important weather or news updates Durable, water resistant, and lighter than a paper back book. Slip it easily into your pocket or go hands free with the attached lanyard.